I am thrilled with the completion of this quilt. Making a quilt with such a large group is an amazing way to get your quilting on. This is my Anthologie quilt that I made from October 2018 to the end of March 2018. It was part of the #BariJQuiltAlong and took place on Bari’s blog here. During the quilt along I felt supported, encouraged, and excited throughout. If you find that you often stall in your quilt making, having a group or QAL to hold you accountable might keep you on pace a bit more. 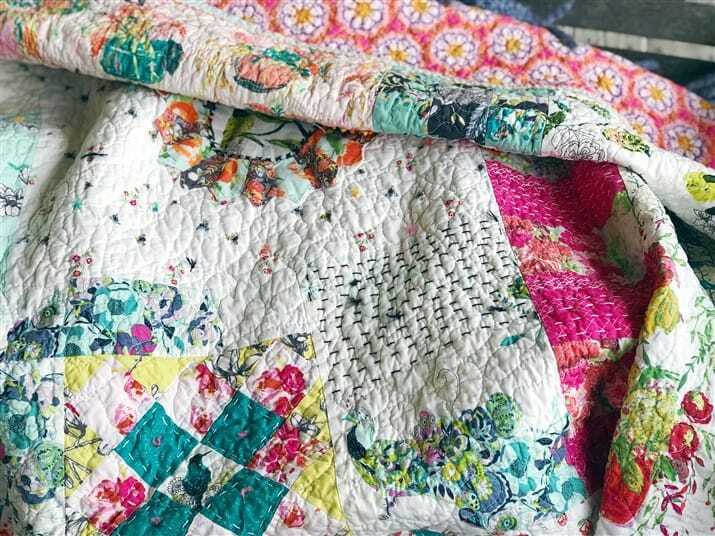 Also if you are new to quilt making, I feel like sampler quilts are a great way to learn many different skills and techniques within the same project. 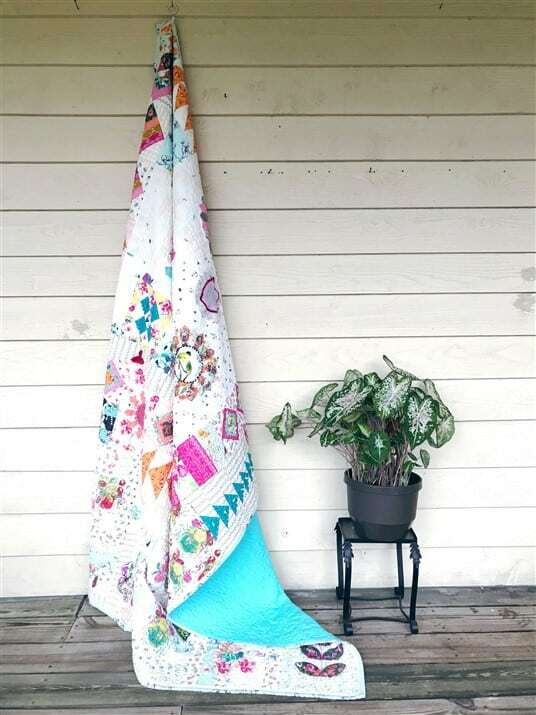 Scroll down to the bottom to find every pattern for this quilt. The majority of the fabrics that went into my quilt is the Wild Bloom collection by Bari J. By making this quilt, which is my very first sampler design (oh, there will be more), I wanted to explore the style “bohemian”. I hear that everywhere now! I’m drawn to that style a bit, I think. I also wanted to add other crafts/skills into this quilt, such as: embroidery, tassels, crochet lace binding, and crochet. I wanted to step up my hand quilting game too. And after all the hand quilting I put into this quilt, I really feel quite comfortable with that skill now. I’m also in love and want to add it to everything. For more about hand stitching skills click here. The Dura Snips on a Neck Strap have extra sharp and durable high carbon forged steel blades. Easy squeeze action and unbeatable long-lasting sharpness for precise thread snipping. Fits into a safety storage cap on a convenient neck strap. Fun to use; fun to wear. Keep your thread snips close at hand. The above descriptions is from the Havel’s Sewing website. When I got the snips I was thinking that it would be great to wear them on my neck and always have scissors when I need them. They quickly became so much more than that. They are THE. PERFECT. THREAD. CUTTERS. It’s like they were made for chain piecing. See a demonstration video here. I’ll never chain piece without them again. If you ever need to make a purchase from Havel’s Sewing be sure to use my coupon code ‘southerncharm7’ and get $7 off any order of $25 or more. I have found that I very much enjoy hosting quilt alongs. I think they are my thing. I’ve had to learn to make videos and I REALLY struggled with that in the beginning, but I think I learned a bit there and am certain if I keep trying that will improve. Visit my YouTube channel here and subscribe if you haven’t already. I would like to get some feedback from YOU. If you participated in this quilt along and have time to let me know your thoughts (good and constructive) I’d love to hear them. Visit this page and leave them for me there. If you are wanting another quilt along or have any ideas moving forward, or even want something specific, you can include that info. I feel very strongly about community and I want this place to be somewhere you want to come and be yourself. I also really love hearing from you. AGF Color Master fat Quarter Bundle includes 10 fat quarters. Every box is unique and includes randomly selected fat quarter cuts from a mix of Art Gallery collections in a printed designer box. Pick a color and purchase here. Can I still make this quilt? Yes, absolutely. All the posts and pictures can be found on Bari’s website here. If you just want the patterns, you can find them below. Well, I’m not quite sure, but I do have something in the works. I’m waiting on approval now and should know if all things are a go in a few weeks. If approved, the QAL will begin at the end of summer and be focused more on color and choosing and mixing fabrics (something I get asked about all the time). I’ve even got a theme picked out, but I need to shhhh, because I’ve got no okays as of yet. If you need a quilt along right now, the Morning Sun quilt along is still happening by email and on IG here. We are about half way thru, but there’s plenty of time to catch up. Thank you for being so sweet and kind and supportive. It doesn’t go unnoticed and I am always grateful. 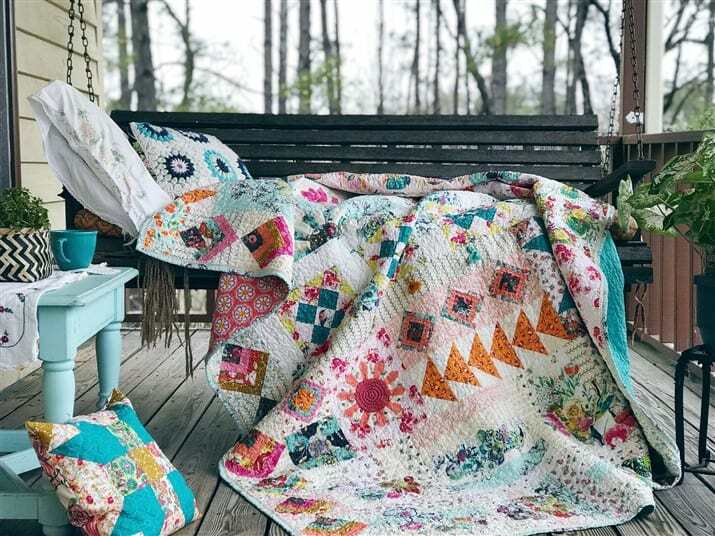 i think you know how much i LOVED this QAL, i have gushed about it everywhere…but maybe another brand new quilter (like me) is reading this and is unsure if this is something they could tackle…? and i would want them to know that YES, they can!! and in fact, this was THE MOST PERFECT way to learn about quilting!! 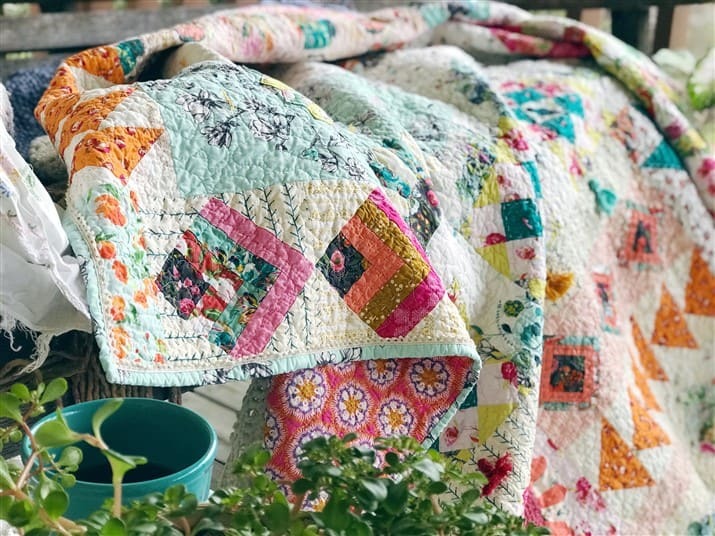 this sampler quilt teaches so many different types of blocks, so you can discover your favorites (mine were the mod tulips) and Melanie, you are such a kind, patient, and encouraging teacher!! and each of the lessons with accompanying videos are SO thorough and easy to follow!! i am so glad that you were able to conquer your fear of video, bcuz honestly that was my favorite part of this QAL!! you are awewome!! 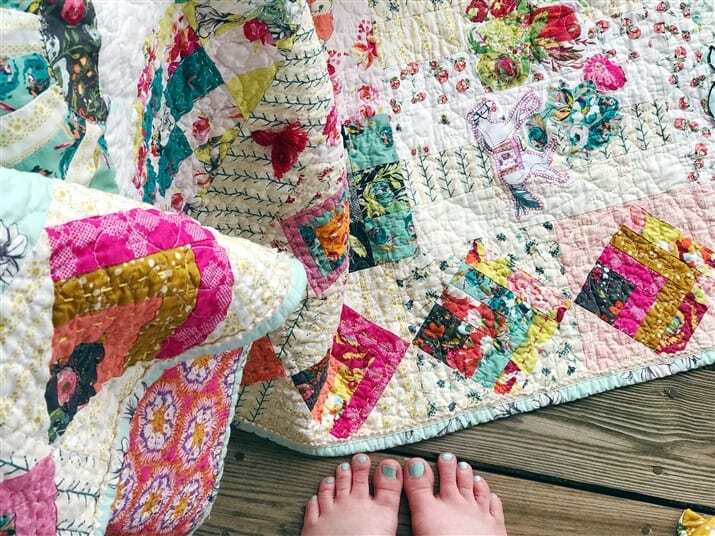 and finally – LOOK at this amazing gorgeous quilt you have at the end!! IT IS BEAUTIFUL!! i still have to quilt and bind mine, but i had to take a short break, but i know when i am ready, i cqn come back and the lessons will be there for me… THANK YOU SO MUCH , I am offically addicted to quilting!! I have so enjoyed this QAL, and learnt heaps! My quilt came back from the quilters today, it’s looking lovely! I’ve watched your video and am now about to add a few ‘extra’ bits of big stitch handquilting. Thanks for running this pretty QAL. I’ve never done a quilt along…my insecurities get the better of me and I end up book marking the project for a later date. Well today is the date lol, I purchased some funky fabric (Tula Pink, Fasset etc.) which is way out of my traditional comfort zone in hopes of making a funky quilt for my daughter. Well, I’ve been staring at this fabric for months not having a clue what to do with it…until today!!! I’m SO thrilled because this quilt will be perfect with that material!! 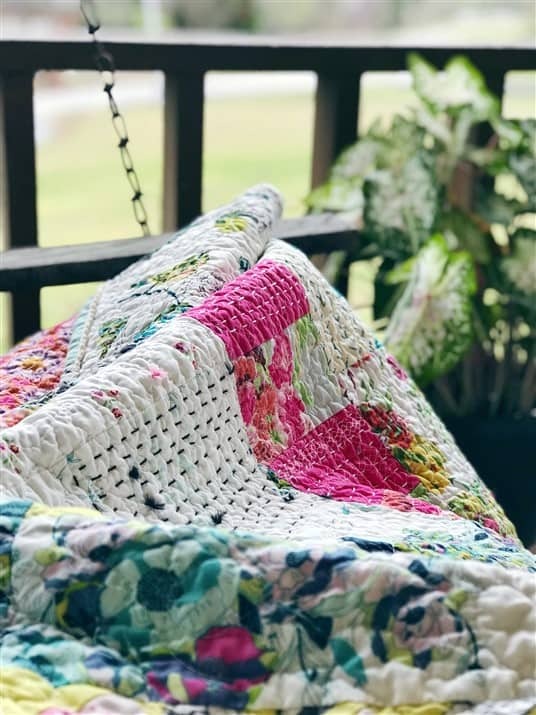 Big hugs for creating this beautiful pattern….now I need to get off my duff and get this done in 4 days lol, so I can surprise her when she moves into her new apartment. Hi Michelle! I hope you’ll join in on the newest quilt along in September as well. Don’t be insecure! You totally can do this and there will be video tutorials all along the way. 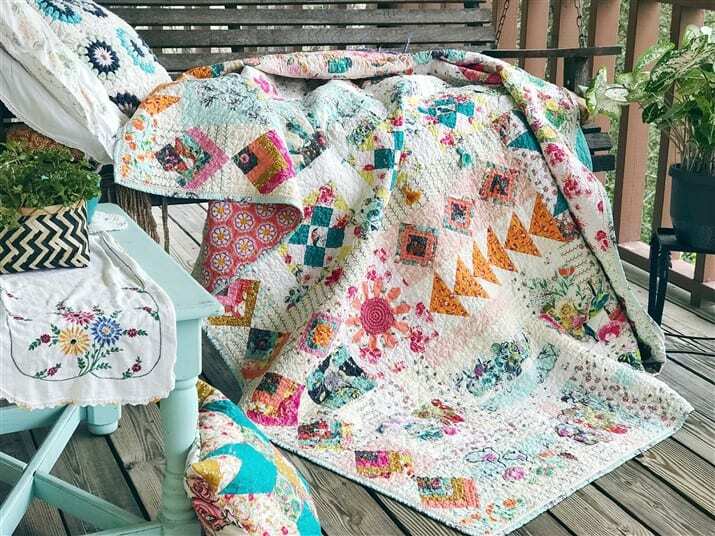 Even though I am little late in the game, I can’t wait to make this quilt! I have found some fabulous fabrics to use. Looking at the fabric requirements, the directions say “Background – 2.75 yards” As I pored over the pictures, I was a little unsure which ones were the background fabrics. Is it a solid? Just trying to figure out what to buy. Thank you so much! Hi! The background is all the low volume shown in the quilt. 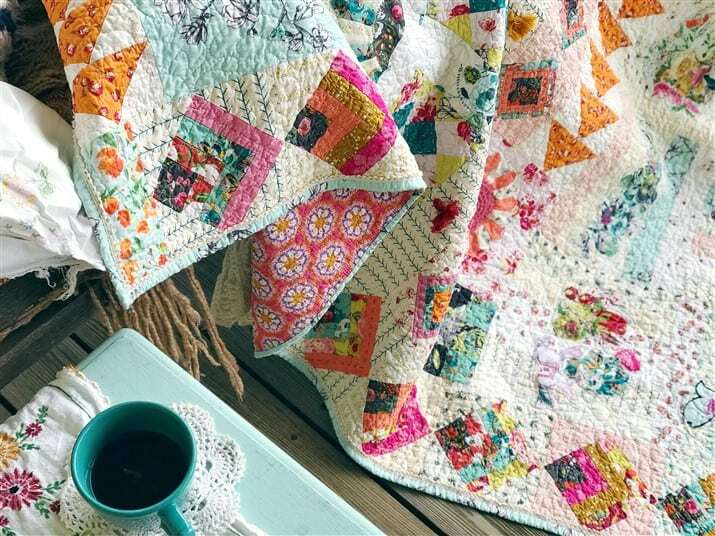 Hello, this is such beautiful quilt! I appreciate so much the opportunity to develop my skills. I am late to find this QAL and so it is over; however I am excited about following along at my own pace. While printing the patterns I realized that Pattern 1-La Fluer is missing. When I click on link 2. La Fluer, Pattern 2-Floral Cottage Block comes up. I am hoping that you can direct me to where I might find the pattern for La Fluer. Thank you. Hey Linda, My apologies!! I’ve corrected the link to La Fleur. It should work now. Sorry again! 🙂 Enjoy the quilt along!